The Council of Indigenous and Popular Organizations of Honduras (COPINH) demands an investigation by independent and impartial experts to identify those physically responsible for the political assassination of Berta Isabel Flores, General Coordinator of COPINH, as well as the intellectual authors of this crime. Specifically, we demand that the Honduran state sign an agreement with the Inter-American Commission on Human Rights (IACHR) to send independent experts to conduct a clean, impartial, and transparent investigation. COPINH emphatically denounces the Honduran state’s manipulation of the investigation into the murder of our compañera Berta Cáceres Flores with the aim of criminalizing COPINH and repairing its own image, nationally and internationally. We denounce the state’s intention to obfuscate the political assassination of Berta Cáceres Flores by saying that it was a personal crime or a “crime of passion.” We denounce that the Honduran state is focusing its investigation on blaming members of COPINH. We denounce the clumsy handling of the investigation, including rejecting the family’s request to the Public Ministry to have Berta’s autopsy performed in the presence of independent forensic experts. Investigators’ also seized the vehicle and shoes of Tomas Gómez, Coordinator of the organization, without any justification. We denounce the Honduran state’s detention for 48 hours of Aureliano Molina Villanueva, a member of COPINH, despite the fact that witnesses state Aureliano was in San Francisco de Lempira, two hours from La Esperanza, at the time of the murder. It is clear that the Honduran state—the very state that sought to criminalize Berta Cáceres, the very state that gave an order for her arrest, and the very state that persecuted and threatened her—holds responsibility for her assassination and cannot be in charge of investigating itself. The state that persecuted Berta Cáceres for confronting the country’s economic and political elites clearly intends to manipulate the investigation in order to continue criminalizing and maligning her. We know with certainty that the murder of Berta Cáceres was a political assassination meant to silence a national leader in the struggle against the neoliberal development model, based on destruction and death, imposed by the Honduran state. We hold the Honduran state and the political and economic elites responsible for seeking to silence Berta Cáceres’ struggle in defense of the environment, the indigenous Lenca people, and especially the Gualcarque River where the DESA company is trying for a second time to build an illegal and illegitimate mega-hydroelectric dam. We denounce that early in the morning on March 2, the day of Berta Cáceres’ murder, witnesses saw hit men (sicarios) from DESA in a blue Ford 150 vehicle, in Siguatepeque near the turn for La Esperanza, and heard them speaking ill of Berta Cáceres. 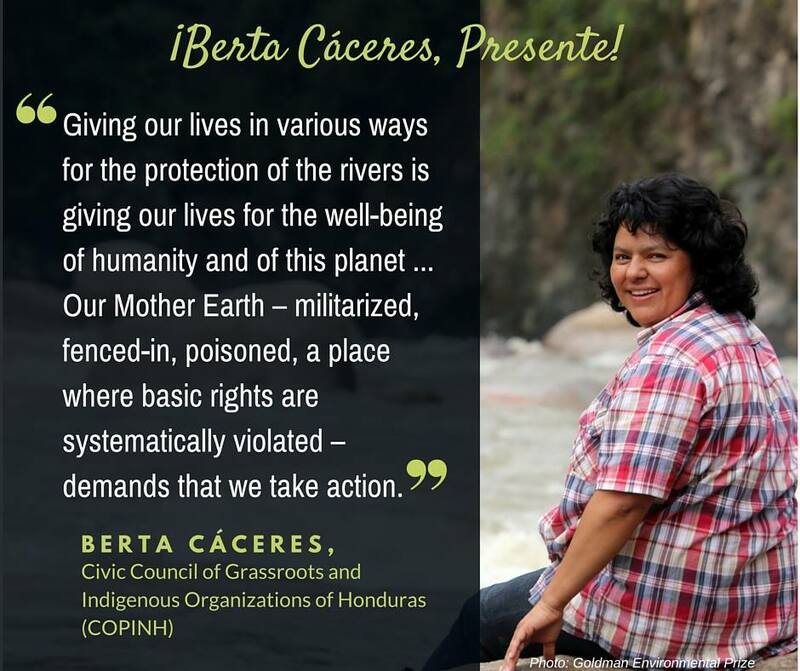 We denounce that on February 20, 2016, during COPINH’s protest against the Agua Zarca hydroelectric dam, the Vice-Mayor of San Francisco de Ojuera (who is collaborating with DESA to promote the dam project) sentenced Berta Cáceres to death. On February 16, 2016, armed men followed Berta Cáceres and other COPINH members as they left Río Blanco, following them in a vehicle from Plan de Encima to Zacapa. And on February 25, during the forced eviction of COPINH Lenca families in Jarcia, Guinse, Intibuca, by the police and military, a member of the National Direction of Criminal Investigation (DGIC in Spanish) police unit harassed Berta Cáceres and told her that they wouldn’t be responsible if anything happened to her. Berta received constant death threats for her work in defense of the Lenca people, including in the days leading up to her murder. We reiterate the denunciation made by COPINH on February 20, that DESA has contracted known criminals to work as paramilitary guards. One of them was involved in the murder of Bernardo Pérez and, in late December 2015, was detained for illegal possession of firearms but later set free after being openly supported with funds from DESA’s Chief of Security for Agua Zarca, Jorge Ávila. We reiterate our denunciation of the collaboration between DESA and the Honduran state to threaten the Lenca people, and we denounce the collaboration among private guards, police, military, and TIGRES (special forces) deployed in the area where the Agua Zarca dam is planned. If the Public Prosecutor’s office really wants to investigate the murder of Berta Cáceres, they should confiscate and investigate DESA’s vehicles, specifically the blue Ford 150 that was seen carrying DESA hit men on the day of Berta’s assassination. The Honduran state has prohibited Gustavo Castro Soto—who was a witness to the murder and also received a gunshot injury during the attack—from leaving the country. Gustavo is the Coordinator of Other Worlds/Friends of the Earth Mexico. He has already given his testimony to investigators. This morning he was stopped from boarding a plan to return to Mexico and we denounce the threats to his safety. We denounce that he is being brought back to La Esperanza, where his safety is in danger. We demand an investigation of the economic and political elites behind the assassination of Berta Cáceres Flores, which will require independent and impartial experts. We demand justice for Berta Cáceres Flores! We demand that her real killers be found! We demand that the state of Honduras stop manipulating the investigation and sign an agreement with the Inter-American Commission on Human Rights immediately, so that they may start their impartial and transparent investigation. We demand the withdrawal of DESA from the Gualcarque River and financial institutions such as FMO and Finnfund should also withdraw their funding and support from the Agua Zarca project. We demand an end to the criminalization of COPINH and respect for the physical security of Tomas Gómez, Coordinator of COPINH, the rest of the members of the General Coordination team of COPINH, and all the members of COPINH in Río Blanco and in other communities. We demand an end to the murder, persecution, militarization, and criminalization of all defenders of the Honduran people. We reaffirm our struggle in defense of the environment and the Lenca people. We reaffirm our defense of the Gualcarque River. WITH THE ANCESTRAL FORCE OF LEMPIRA, MOTA, AND ENTEMPICA, WE RAISE OUR VOICES FILLED WITH LIFE, JUSTICE, DIGNITY, AND PEACE. This entry was posted in Blog and tagged human rights, indigenous, Water. Bookmark the permalink.